9 Best Shinola Watch Review – Are They Any Good? Hello everyone, I’ve been wanting to do this one for a little whilst now, today I’m putting together a Shinola watch review. 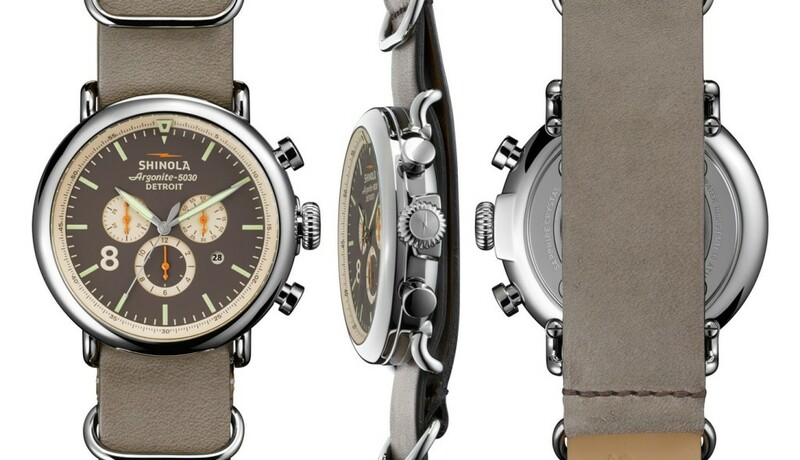 I’ll be taking a look at the overall quality of the brand and the history of them before finishing off with a list of 9 popular Shinola watches for you to take a peek at. A watch made in Detroit, a simple idea that grew a once small brand into a global supplier of watches and of lifestyle products. Shinola was created by Tom Kartsotis in 2011, it’s a popular luxury lifestyle brand in the United states which is now owned by Bedrock Brands, a Texas Investment Group. Shinola has established themselves with a “Built in Detroit” tag line which has become quite the achievement in Detroit. You see in 2007 when the recession hit, Detroit got hit real bad. Much of the manufacturing in Detroit was gutted and the city of Detroit eventually has to file for chapter 9 bankruptcy in 2013. When Shinola came along and wanted to set up shop with their manufacturing in Detroit it gave a real feel good image to the brand. Many people now start off finding the Shinola brand when searching for a watch made in Detroit. 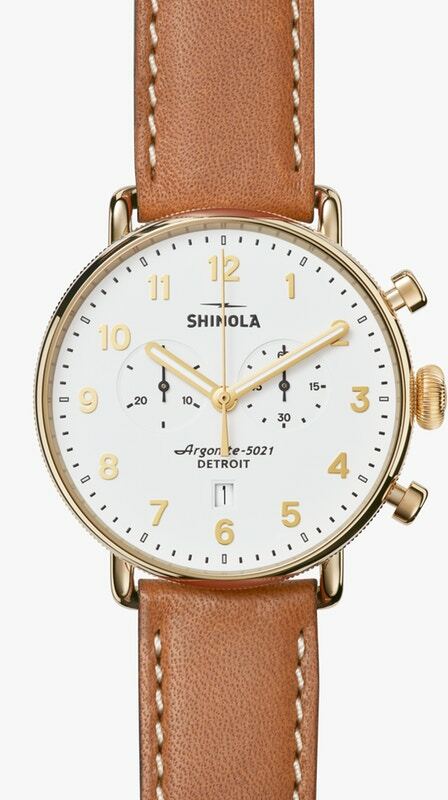 The first Shinola Detroit watches were introduced by the brand in March 2013. 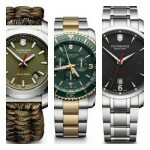 Their first edition was available in two different sizes with 2,500 watches available. They had them on sale for $550 and managed to sell out of their larger 47mm edition within one week which is an impressive achievement. Their second limited edition watch was then introduced in the October of 2013 and also sold very well. These days Shinola have a large selection of Signature Series limited edition watches which have proved to be very popular. They also made good use of combining their selection of watches with their bicycles and other related products that they’ve grown to offer. 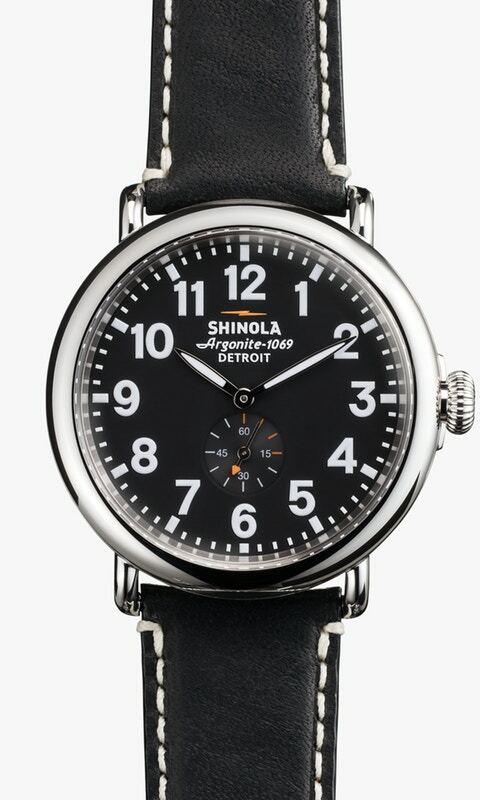 Shinola has built their brand on the back of their desire to help the area of Detroit. Whereas many brands would just get their watches assembled and built in China or Asia, they decided they wanted to do something different and relied on peoples desire to help the local area also. They’re no denying that purchasing a watch from a brand that directly provides jobs in your local area gives you a bit of a feel good feeling. Learn more about Shinola Watches history here. Or why not check out the Shinola wiki page. So are these Shinola watches actually any good? 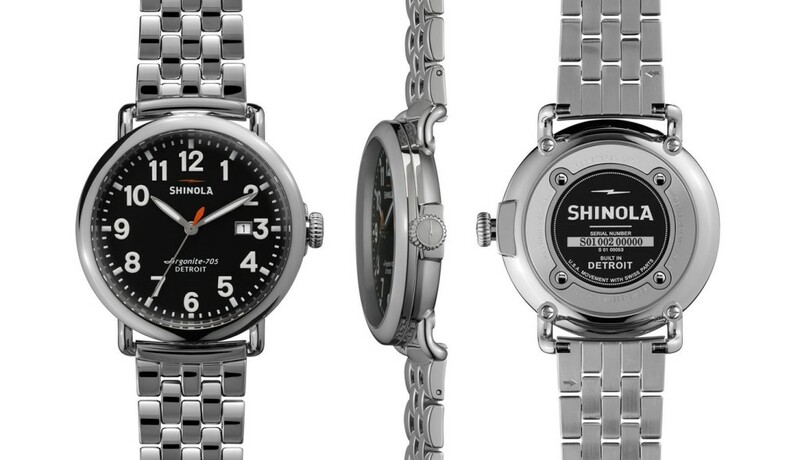 Shinola watches are actually assembled in the United States in the city of Detroit. Each Shinola worker involved in the Assembly process of the watches has to undergo extensive training by Ronda AG. Shinola watches are well built with high-quality components are assembled in Detroit by local workers. They offer a sense of timeless design with their wide selection of styles like The Runwell collection of The Black Blizzard if you’re after something even more luxurious. It’s also nice to know you’re helping out a once struggling city that was hit extremely hard by the recession. Because of this, the brand has actually had a very high level of support. President Barack Obama presented a custom made Shinola watch the UK Prime Minister David Cameron in 2016. It was a gift the featured the Presidential Seal. You’ll actually find several politicians have supported the Shinola brand. The only real downside to Shinola is that they are essentially still only a quartz timepiece. Don’t get me wrong, they’re extremely well made Swiss quartz watches, but quartz still the same. At this price point you could go out and get a quality mechanical watch, but that’s not the point of the brand. Overall I’d happily say that Shinola watches are very good. I like the idea of helping out a struggling area, a tougher route to go instead of producing abroad. The watches are well built with high-quality parts and have a range of impressive designs. 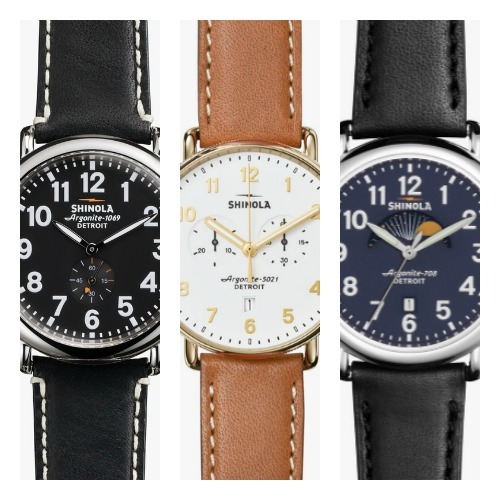 Below I’ve featured 9 popular watches from Shinola. If you have any questions about any of the watches featured here simply comment at the end and I’ll try and help you out as soon as I can. First up in today’s list of the top Shinola watches is this The Runwell chronograph timepiece. This ‘The Runwell’ is built with a large 41mm stainless steel casing that has a thickness of 12mm. The strap is made of a nice thick genuine leather and fastens with a buckle style clasp. I really like the dial design on this timepiece, it reminds me of typical pilot watch style with large easy to read numerals with luminescent hands and markers for better visibility in dim lit conditions. There’s a date display at the 6 o’clock position and the two sub-dials display a 60 second and 30 minute chronograph. 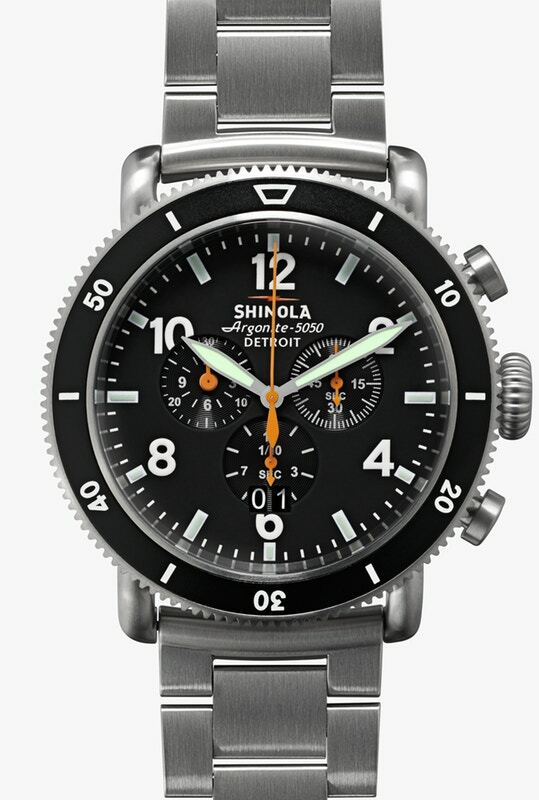 As you’d expect from Shinola Detroit watches this model features a quality sapphire crystal glass that gives you a high level of scratch protection. Powering this Sinola watch is a Sinola Calibre Argonite 5021 quartz movement for reliable and accurate timekeeping. The watch also has a 100m water resistance rating which can come in handy. You can read my full S01000096 Shinola Runwell review here soon. 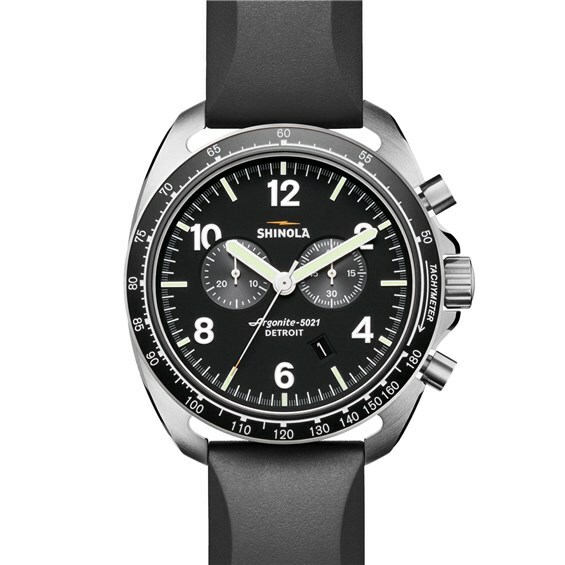 Next up on today’s Shinola watches review is this popular chronograph edition. It’s built with a large 44mm stainless steel casing that features a tachymeter display on the bezel. The thickness of the casing is 14mm making it a little bit of a chunky watch. The strap is made of a high quality rubber in black and fastens with a buckle style clasp. The crown on this model does screw down. The dial features a combination of these large bold numeral and baton style hour markers that really stand out against the black background. The hands have a wide design making them easier to read too. The hands and hour markers have a coating of Super-Luminova for better visibility in dim lit conditions. The dial also features two chronograph sun-dials as well as a small date function located at the 5 o’clock position. At the heart of this men’s Shinola The Rambler watch is an Argonite 5021 quartz movement with Swiss and various other imported parts. It’s an accurate and reliable movement. A sapphire crystal glass on the front of the watch gives you an excellent level of scratch resistance too. It also has a 100m water resistance rating which is nice to have. You can read my full The Rambler Shinola watch review here soon. Here we have one of Shinola’s more complex watches with a commanding dial features three sub-dials as well as a date indicator. This model is built with a highly polished stainless steel casing with a 47mm diameter making it an oversized watch. The thickness of this casing is approximately 14mm. The straps itself is made of a soft genuine leather in a grey stone colour. The crown on this model also screws down. On the dial, we have three chronograph sub dials as well as a small date indicator at the 4 o’clock position. The hands and hour markers have a generous coating of Super Luminova for excellent visibility in dim lit conditions. The movement of this watch is a high accuracy Argonite 5030 quartz which is hand assembled from 83 Swiss and other imported components. Protecting the front of the watch is a double curve sapphire crystal glass which gives you a very high level of scratch resistance. You’ll be able to read my full 10000074 Shinola watches review here shortly. Next up we have another popular timepiece from the Shinola The Runwell collection. This men’s watch is built to last with a focus on the highest possible quality. This Shinola watch is built with a highly polished stainless steel casing with a diameter of 41mm and a thickness of 10.5mm. The strap is made of a genuine leather and comes in black, it fastens with a buckle style clasp. Note that the crown on this watch also screws down. On the dial we have two neat little hands along with a longer seconds hand with an orange tipped end. The numeral hour markers have a bold design making them easier to read at a glance. They also have a coating of Super-Luminova on the hands for better visibility in dim lit conditions. At the heart of this Shinola Detroit watch is an Argonite 705 high accuracy quartz movement which is made with a combination of Swiss and other imported parts. A double curved sapphire crystal glass has been used to give you some of the best scratch resistance possible. 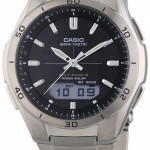 This model has a smaller 50m water resistance rating also. You’ll be able to read my detailed Shinola watch reviews here soon. 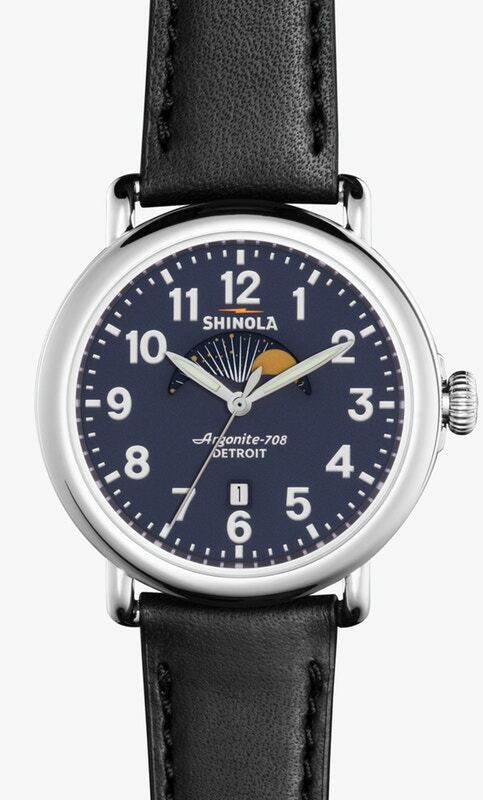 This is a Shinola moon phase watch from The Runwell collection. I’m a big fan of moon phase watches so I love that Shinola has produced their own one. The casing of this Shinola watch has a brilliant polished finish. The diameter of the stainless steel casing is 41mm with a thickness of 11mm. They’ve paired this up with a lovely black genuine leather strap that fastens with a buckle clasp. The crown on this model also screws down. The dial of this The Runwell Shinola watch comes in a beautiful midnight blue finish with a three hand display and bold numeral style hour markers. The hands of the watch are coated in Super-Luminova for excellent visibility at night. A key feature of this model is the moon phase complication which I think adds an interesting aspect to the design of the dial. 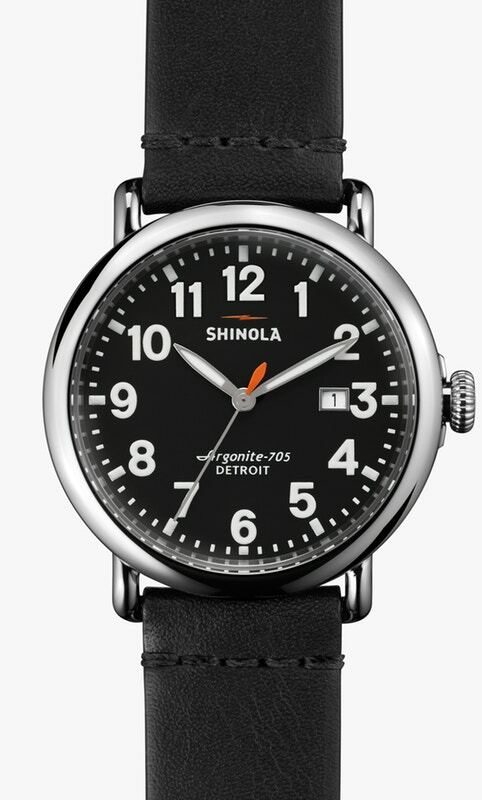 This Shinola Detroit watch is powered by a Argonite 708.1 quartz movement for reliable and accurate timekeeping. The double curve sapphire crystal glass on the front of the watch gives you an excellent level of scratch resistance. Like the previous Shinola watch, this model also has a 50m water resistance rating. I’ll add in the link to my full S0100114 Shinola reviews here shortly. Next up we have a classic looking Shinola watch that’s built to last with the finest components. It’s part of the Shinoda The Runwell collection and is built with a 41mm stainless steel casing with a thickness of 11mm The crown on this model also has a screw-down design. The strap is made of stainless steel and fastens with a push release butterfly clasp. On the dial we have large Arabic style numeral hour markers along with these long slim hands and a orange ended seconds hand for a dash of colour. The hands and hour markers are coated in Super-Luminova for brilliant visibility in dim lit conditions. There’s also a handy date display at the 3 o’clock position. Powering this The Runwell Shinola watch is an Argonite 705 movement which is a 46 piece quartz movement that’s made with a combination of Swiss and other imported parts. The watch has a 50m water resistance rating and also comes with a double curved sapphire crystal glass for some of the highest scratch protection available. You can read my full 10000053 The Runwell Shinola watch review here soon. I really like the look of this next Shinola timepiece with its minimalist watch design. This model is built with a beautiful PVD gold plated high polish stainless steel casing with a 43mm diameter and a thickness of 13mm. The strap is made of this light tan Beaumont coloured leather and fastens with a buckle clasp. Note that this model has a push down crown. The Canfield Shinola watch is different from the previous Shinola watches as it requires a front loaded assembly and design with the bezel closing last. This allows them to get away with this sophisticated looking open dial viewing area with a refined minute track and slim, diamond-cut hands. You can’t see it too easily in this picture but there’s a stunning coin edged detail around the edge of the casing. The hands of the dial have a coating of Super-Lluminova for better visibility in dim lit conditions. There are also two chronograph sub-dials and a date function on display. At the heart of this Shinola men’s watch is an Argonite 5021 quartz movement for reliable and accurate timekeeping. The movement is made with a combination of Swiss and other imported components. A high quality double curve sapphire crystal glass protects from scratches. It also has a 50m water resistance rating. You’ll be able to read my full detailed Shinola review for this model soon. The Black Blizzard by Shinola watches was inspired by the Dust Bowl of the 1930s. It’s an oversized men’s watch with a titanim casing that makes it stronger yet lighter than stainless steel. The titanium casing has a large 48mm diameter which makes it a fairly oversized timepiece. The strap of the Shinola Black Blizzard is also made of titanium and fastens with a double push release butterfly clasp. The bezel also features a beautiful coin edged finish. Note that the crown of the watch screws down on this model. The dial features a sports watch design with 3 chronograph sub dials on display. The large bold numerals and hour markers making it very easy to read this watch at a glance. Note that the hands and hour markers also have a coating of Super-LumiNova for excellent visibility at night. Powering this men’s oversized Shinola watch is a Argonite quarz movement for accurate and reliable timekeeping. It’s built with a combination of Swiss and other imported components. This Shinola watch actualy has a very good 200m water resistance rating making it the highest on this list so far. It also features a double curve sapphire crystal glass for excellent scratch protection. Soon you’ll be able to read my full detailed Black Blizzard Shinola review here. In at number 9 we have this fantastic high visibility Shinola watch from The Runwell collection. This 41mm stainless steel watch has a highly polished finish and a thickness of 11mm. The crown on this model does screw down. It’s been paired up with a contrasting stitch genuine leather strap that fastens with a buckle style clasp. On the dial we see these large bold white contrasting hour markers that make reading the watch at a glance very simple. The hands and hour markers have a coating of Super-Luminova for excellent visibility in dim lit conditions. I’m a big fan of watches that features the seconds display on a separate sub-dial like this. At the heart of this Shinola watch is a Argonite 1069 high accuracy quartz movement for reliable timekeeping. Protecting the dial is a double curve sapphire crystal glass for a high level of scratch resistance which is always nice to have. 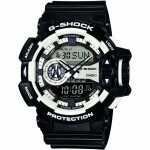 Last but not least is the 50m water resistance rating. 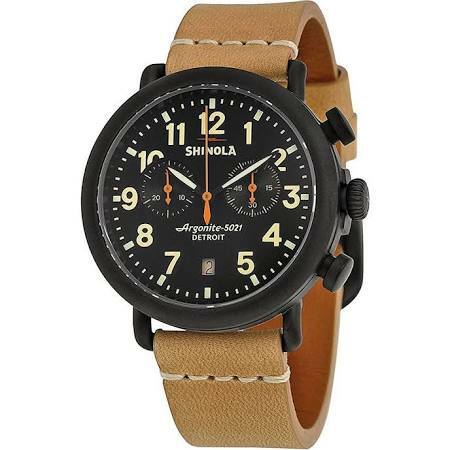 Overall this is more of an affordable Shinola watch compared to some of the previous models. I’ll be linking of to a fully detailed quality Shinola watches review here in the next few weeks. As always, I’d like to say a massive thank you for taking the time to read through my Shinola watches review today. What was your favourite Shinola watch featured today? Comment below and let me know.